the 27M looks unwell for that distance too.. what is your exact attenuation? in experience with faults i have had, very very few visionstream techs know what they are talking about with vdsl short of, look the light goes, it works. or we reset DLM give it 10 days. your connections almost could do with a thread of its own for a bit of a discussion on the differences between them, out of interest if not anything else. We have seen a few cases where 17a is reported, but the spectrum isn't actually used. Ild question if maybe this is the case for you. Just doesn't seem right otherwise.. I'll look forward to seeing detail though, sounds like a good comparison that we don't see very often - multiple links assumed to be with the sane exact factors involved. Hopefully chorusnz can atlest take out some of the guessing in who's a valid target for 17a. We have a number of conditions that must be met for your line to be switched to a 17a Spectrum profile. If your line is on the 17a spectrum profile, but the spectrum between 8Mhz and 17Mhz is not being used, I'd be looking at your CPE. it shouldn't report 17a unless the DSLAM is providing that, and we run 8b and 17a on independant profiles. Hopefully this helps answer some questions? that is very helpful indeed, its great to have an uptodate answer on it. just to clarify, DLM is in operation on the line, are you referring to the DLM training period, or simply DLM being there? clearly the measurements are taken at different frequency to a vdsl line itself, by theses conditions, ild tentatively say my line of 217M (electrical length calculated via modem..) or 4.4dB would come under that? keep in mind that is only the criteria to be eligible for switching. If the switch happens, and the line is unstable (lots of noise/interference in the higher frequency bands) DLM may need to switch back. correct, the measurement is not the DSL attenuation. if your line is 217M and 4.4dB, then DLM will have attempted 17a. it may or may not have stayed there depending on line stability. i fully understand there are other factors involved, and by no part do i expect a magic switch, simply understanding the process more than i feel i already do. how does one go about getting a port reset done? we had a sparky in recently and he had the power off a few times + my son switched off the multi board the router is powered from (this has been fixed). I was on DLM-1 but since the above its sitting on DLM-2. the stats are pretty much the same as when i was on DLM-1. and the modem had been up for 9 days since the last reset so i would have though DLM would have gone and done its thing again. Also about the 17a profile, im less than 100m from the cabinet, i guess DLM is working on my line but see above, and my attenuation is ~6.2dB. is there any way to know if 17a has been tried? 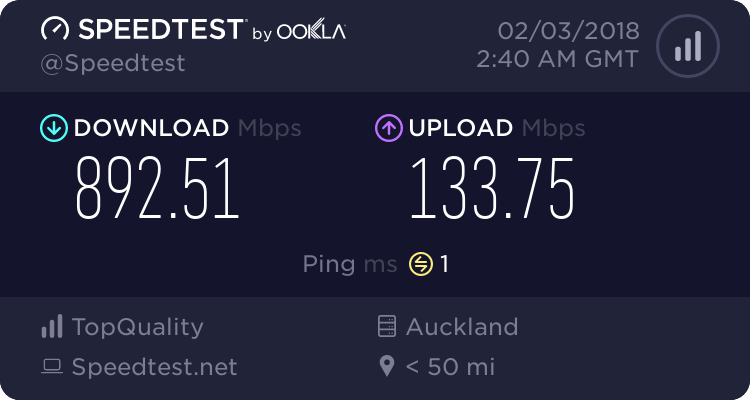 Jase2985: how does one go about getting a port reset done? we had a sparky in recently and he had the power off a few times + my son switched off the multi board the router is powered from (this has been fixed). DLM continually monitors and evaluate a line for stability. It will then choose the best profile set. People really do need to rest assured that DLM is always doing the best possible for your line and the lines around you - remember its about providing a stable service for everyone, not a high speed service just for you. For all I know, someone other premises within your cable bundle upgraded to VDSL around the same time as you had the sparky in. And funny that, i just checked my modem stats again and i was bumped to the 17a profile about 540am this morning, currently sitting on DLM-2. alike the ISP folk around here that do line checks for people, i wouldnt wish the barrage of requests they probably get upon them, or you..
theres quite a difference between someone flailing around going my internets now fast enough fix it, and someone simply interested in a logical reasoning. very few of the later unfortunately imo, but as long as the flailing is done politely and patiently i find it fair game. It doesn't say on there when Opotiki is getting fibre to the home. The schools here have it. Where up else can I check?